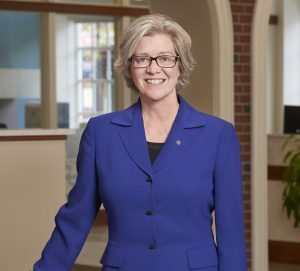 Linda Lorden appointed President of Merrimack County Savings Bank, effective November 1, 2018. The Board of Directors is pleased to announce that Linda Lorden has been appointed President of Merrimack County Savings Bank (the Merrimack), effective November 1, 2018. As a mutually owned community bank without private owners or stockholders, the Merrimack has remained steadfast in fostering the economic health and well-being of the communities it serves since it was founded in 1867. Lorden will be the Bank’s 11th President in 151 years. She replaces Philip Emma, who was recently promoted to Chief Operating Officer for New Hampshire Mutual Bancorp (NHMB). NHMB provides shared support services for its allied financial institutions, which include the Merrimack, Meredith Village Savings Bank, Savings Bank of Walpole and MillRiver Wealth Management. Lorden’s extensive career in banking spans 38 years. She began as a teller at Concord Savings Bank in 1980. In 1998, she joined Bow Mills Bank and Trust. She was named Senior Vice President, Senior Retail Banking Officer when the Merrimack acquired Bow Mills Bank and Trust in 2007. During her leadership, retail deposits grew from approximately $425MM to over $650MM, and the bank added two new branches in Hooksett-at the I-93 northbound Welcome Center and on Londonderry Turnpike. In addition, the Merrimack has been voted “Best Bank” by the Concord Area Peoples’ Preferences (CAPPIES) for the last nine years. Lorden is currently Board President of the Penacook Community Center and an active member of the Board for Bow Rotary Club. She is also a member of the New Hampshire Bankers Legislative Committee, Greater Concord Chamber of Commerce and an active volunteer at the Friendly Kitchen. She previously served on the Board for Riverbend Community Mental Health, was a member of the CATCH Asset Building Coalition and participated on the Granite United Way’s agency review committee for Merrimack County and its Volunteer Income Tax Assistance Committee. She was also previously active with the Red Cross Capitol Campaign and Easter Seals NH VIP Campaign. Charted on July 2, 1867, the Merrimack was originally established for the people of Greater Concord. Its founding principle of being a safe depository for the savings of customers, as well as a fair and reliable lender continues to guide present-day operations. Today, the Merrimack has expanded from a single office location in Concord to nine branches in Bow, Concord, Contoocook, Hooksett and Nashua, though many customers also use the Bank’s extensive services offered through mobile device, telephone and online banking. The Bank and its employees are inspired by Merrimack style, which is guided by the values of accountability, mutuality, excellence, respect, integrity, teamwork and stewardship. The Merrimack was honored with the 2017 Business of the Year Pinnacle Award by the Greater Concord Chamber of Commerce, was voted “Best Bank” by the Capital Area’s People’s Preferences for the 9th consecutive year and named 2017’s “Bank of the Year” by the Capital Regional Development Council.